“It’s a game of cards…and the deck keeps getting bigger every year”. Wise words from Dale Woonton, a seasoned criterium rider with an impressive track record. 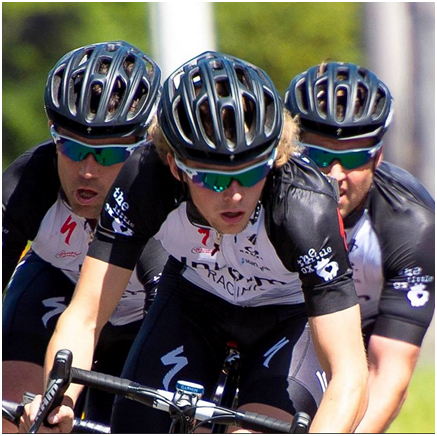 As a fellow team member of Inform Racing I have witnessed Dale achieve multiple A grade wins at Caulfield Carnegie Cycling Club, in addition to a notable win at the Bay Criteriums in Williamstown (Victoria) early this year. Dale clearly has genetics on his side, however the wisdom and flair for racing tactics he demonstrates on the road should not be underestimated. 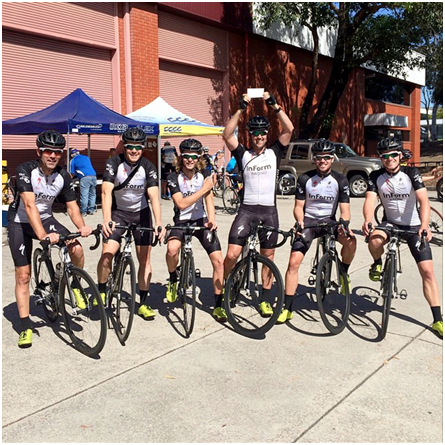 The knowledge and awareness Dale has developed over his more than twenty years of criterium racing creates opportunities which enable him to win races – even against semi professional riders. 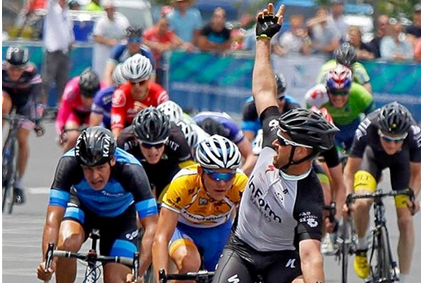 In this article, Dale will share some of his main criterium race tips with you. Whether it’s breakfast before a morning race or a snack leading into a twilight ride, always keep your food intake to a minimum. Those who overeat will feel heavy during a race and potentially still be racing with food digesting in their stomach. Not only will this slow you down and impact your ability to produce effort after effort, but it could also make you feel sick. Dale has seen this first hand. Food intake is a simple yet important factor to consider before a race (stick with a banana to be safe). Many people drive out to criterium races and do a few warm up laps. Not good enough, according to Dale. Unless you’re a couple of hours away from the race location or short of time, you should cycle to the race location to warm up. Dale usually has a forty-five minute commute before a race which he will do at around 300 watts. That’s a decent pace, which will certainly get the heart rate up. The purpose is to ensure the muscles and legs are warm and all the lactic acid from previous training sessions has been removed. Another benefit of this approach is that you avoid having to squeeze in as many laps as you can when you arrive at the track. 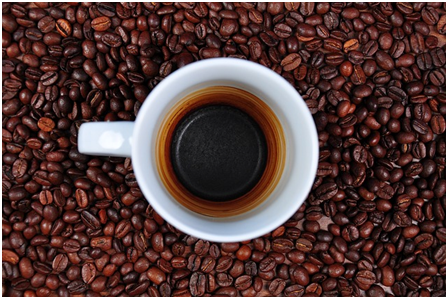 Caffeine is a well-known performance boosting pick-me-up which is widely used to boost physical performance. Dale has a double shot coffee before he leaves home and another shot before starting the race. If he’s feeling good on the day, he’ll pull out a caffeine gel roughly 45 minutes into the race to boost his ability to perform in those final moments. Now there’s a reason for another coffee. Your own strengths and weaknesses: Are you fit enough to roll turns with strong riders and do you have a kick powerful enough to win at the end of a race? These are obvious questions, but riders don’t typically contemplate these before they race. Knowing the answers to these questions will allow you to roll the dice at the most relevant time. Conditions and riders: Dale has ridden against many of the same riders for a while so he knows their strengths and weaknesses and can develop his plan of attack according to who is there on the day. The first couple of laps are also used to assess the wind conditions of the course. Dale is reluctant to join any breakaway groups early on as these breakaways are very unlikely to last for long. However, if it’s a windy day it can sometimes be a good idea to make a move early on. The bunch can typically get shy pushing into heavy winds, whereas a break is more likely to work cohesively. On the flip side, if it’s a still day, you might want to wait towards the pointy end of the race, once the bunch is starting to tire. Once all the peripheral elements have been ticked off, Dale will move up and start to look for opportunities to attack. “Should I or shouldn’t I go”? By the time you’ve asked yourself that question, it’s probably too late. If you see three or four strong cyclists break away from the group and you want to join them, just go as hard as you can. You’d much rather work yourself to the maximum for a couple of minutes to bridge the gap than end up floundering about in no man’s land. You can recover much better from a massive one-minute effort than you can from a prolonged five-minute push. The same applies towards the end of a race. Sometimes you’ll be sitting in a prime position before the last corner, but then all of a sudden a train will come up on your inside. A one-second hesitation here will see you out of contention. 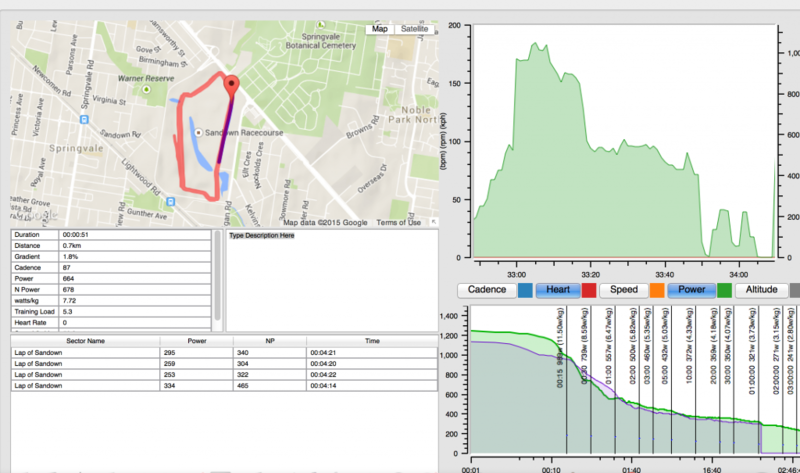 A screen shot from Dale’s power training software, Rider Metrics. It shows Dale bridging the gap to a breakaway with a one-minute push at over 660 watts. Make your efforts short and big, just like this. Being part of a breakaway group can be quite exhilarating which will lead some riders to overexert themselves. According to Dale it’s important to not let adrenaline take control, but instead make sure you’re riding within your limits. If you push too hard you’ll either run out of steam or have nothing left over for the final efforts. If you see someone in the group going too hard, encourage the group to pedal in an orderly fashion. Don’t feel obligated to roll every turn. If you need some water or want to have a nibble, sit out a few turns. There is nothing wrong with that, provided you’re doing your fair share. A well-thought-out set of tactical principles can help you make the right decisions in the final moments of a criterium race and ultimately lead you to victory. Dale’s tactical principles depend on whether he is part of a breakaway or the race finishes in a bunch sprint. In a breakaway group there is always going to be cat and mouse tactics on the final laps. Dale’s advice is to let others make the first move. If you try to break the group apart too early you’re likely to be chased down, only to have burnt a lot of energy. Instead, if you sit in and wait, you can ride the wheels of others who are attempting to break or chase. If there have been a few unsuccessful attempts to break away from the group and everyone else around you is struggling, you might want to try your luck and break away yourself. On the other hand, if you’re a sprinter, you just sit in and wait until the end. If the race finishes with a bunch sprint, you need to be situated at the front of the group to have a chance of crossing the line first. Many crits have a corner 200-300 metres before the finish line so it’s important to be positioned well, before you head into the corner. Ideally you should aim to be in the top three coming out of the corner, and at least top five going into it. Once again – what are your strengths? Your strategy for the final few hundred metres should again be dependent on your personal strengths. Dale can hold a strong 1,200 watt effort for fifteen seconds and over 1,000 watts for thirty seconds. In other words, if Dale has created a gap before the last couple of hundred meters he is unlikely to get caught. On the other hand, Dale doesn’t have the explosive five to ten-second power at over 1,500 watts, so he is less likely to win a short sprint. Personally, I can stay at 1,000 watts for about five seconds, so in a bunch sprint my tactic would be to attack before the last corner, with the hope that everyone hesitates so I can create enough of a gap to not be caught. There’s certainly a lot to consider when racing criteriums, however most importantly you should know your strengths and weaknesses as a rider. By developing your criterium race tactics based on your own riding capabilities and combining these with your assessment of weather conditions and riders, you will maximise your opportunities to cross that finish line in first place.